Tropical storm Emong is gone! 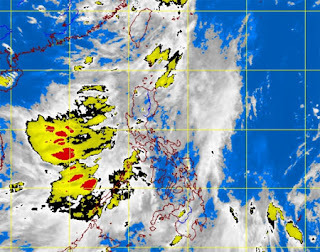 but the new LPA in west of Luzon has intensified into a tropical depression. Bagyong Fabian is here and PAGASA estimated that it will bring moderate to heavy rainfall at an estimated 5 to 15 mm per hr from within its 300-km diameter. PAGASA said that the Low Pressure Area (LPA) West of Batangas has developed into a Tropical Depression and was named "FABIAN." But like Tropical Storm Emong, Tropical Depression "FABIAN" has no direct effect to any part of the country. However, it will enhance the Southwest Monsoon which will bring moderate to occasionally heavy rains and thunderstorms over the western section of Luzon particularly Palawan, according to PAGASA. PAGASA advised fishermen who used small seacrafts to not venture out into the northern and eastern seaboards of Luzon and western seaboards of Southern Luzon due to big waves generated by Tropical Depression "FABIAN". Comments or suggestions about "Bagyong Fabian PAGASA Weather Update" is important to us, you may share it by using the comment box below.